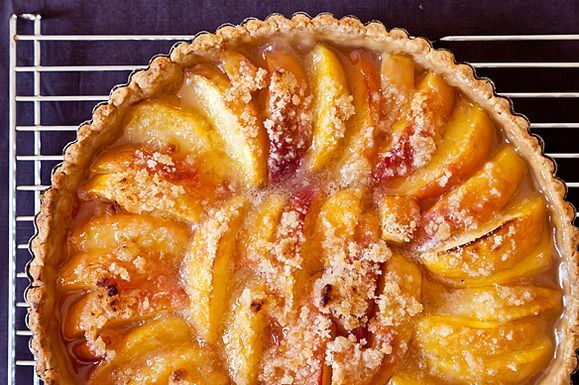 Congratulations to Amanda, whose Peach Tart won the A&M Summer Smackdown! And Merrill may have lost, but she still gets a Q&A for being a good sport (read on below). Merrill has won the past two A&M smackdowns. How does it feel to finally win? Not sure how Merrill has handled this much glory, so often. Anyone or anything you'd like to thank for your victory? I'd like to thank my mother, who lets me rip off her recipes. She is The Giving Tree of recipes. In the interest of good sportsmanship: what is your all-time favorite recipe of Merrill's? Applesauce Cake with Caramel Glaze - 4 stars!! I dream about this cake. What's the best thing you've cooked recently? This tart. All downhill from here. What do you hope the next smackdown will be? Anything but Merrill's sweet spot: creme fraiche. How does it feel to finally lose? Anyone or anything you'd like to blame for your defeat? I'd like to blame Amanda's mother for passing on such a darned good tart recipe. Even my own family turned on me when they tasted Amanda's tart. In the interest of good sportsmanship: what is your all-time favorite recipe of Amanda's? 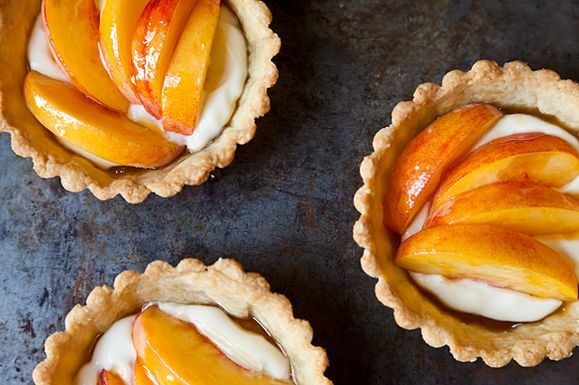 This peach tart may just be it! But her Chocolate Dump-It Cake is also not to be missed. What is the best thing you've cooked recently? Amanda's peach tart! Aside from that, I recently made the Genius Sticky Balsamic Ribs for the second time this month -- they're just amazing. Something involving lots of dairy products -- I'm good with those. We love cooking, and we hope you'll hang out with us at Food52! I didn't make Merrill's entry this time, but Amanda's is a super-keeper. I've been ORDERED to make it again and again. And the crust alone is worth the money. My trial was terrible. Peaches weren't ripe enough so I tried to add sugar later and it got soupy and the crust was too thin and too salty....But I bought a pan, so I'll have to try again. But taking the skins off was easy. Next time I'll try just scoring them. Amanda's recipe was flexible. First I made the peach tart. Yum - easy and beautiful. Then I made another the next day using different fruit: a layer of one grated apple then a layer of blackberries on the top. I used substituted some of the sugar with brown sugar and added cinnamon to the topping. Pretty and tasty. Thanks for the recipe. I enjoyed both tart and tartlet recipes. I managed to prepare and try them both in the nick of time for voting. A few days later, faced with a lot of leftover mascarpone, I made a hybrid tart using Merrill's topping and a tart shell that I think is the best of both worlds. It used almond flour from Merrill's recipe, but using Amanda's preparation method as well as the oil/extract. Yummm. I made the peach tart and I didn't think it was that great. Maybe my peaches were too ripe and juicy (I paid $14.50 for 6 peaches at the SF FM so I was going to use them!) so the crust was on the soggy side. I put the 2 T of flour in but the juice still went over the side. It looked great though. I think I prefer a pie with a butter crust. I love everything about Food 52, even a smackdown Q&A! A little smile to start the day. I'm giggling, love your Q&As, Amanda and Merrill! Congratulations to Amanda, and I'm so glad that you included Merrill in the Q&A: a very gracious looser. I can't wait for the next smack down. How about dried beans? Congrats, Amanda! That Merrill is pretty stiff competition. And I don't know how I've gone this long without making that Applesauce Cake and Chocolate Dump-It Cake. I have a feeling I'm going to be baking a lot over the next few weeks. Congrats Amanda! This is turning into quite the horse race now. Congrats, Amanda! It even seems Merrill thinks your win was well-deserved! Can't wait to see what the next smack-down will bring.